A big chunk of the history of photography is represented, although haphazardly, by the 82 dealers making up this year's Association of International Photography Art Dealers Show. At Hans P. Kraus Jr.'s booth, you can see the earliest photographic image of a whole human being: a paper negative and its positive print picturing a footman holding open a carriage door, made in 1840 by William Henry Fox Talbot. Kraus also has a pair of large photogravures of the Moon's surface, shot from the Paris Observatory in 1895 by Maurice Loewy and Pierre Henri Puiseux. At the recent end, relatively newfangled if not groundbreaking approaches are scattered throughout the show, along with myriad works by Modernist masters like Edward Weston and Robert Frank. Operating between abstraction and conceptualism, Damion Berger makes large night photographs, printed as negatives, in which fireworks trace lacy patterns of bursts and sweeping black lines on gray skies (at Lisa Sette). 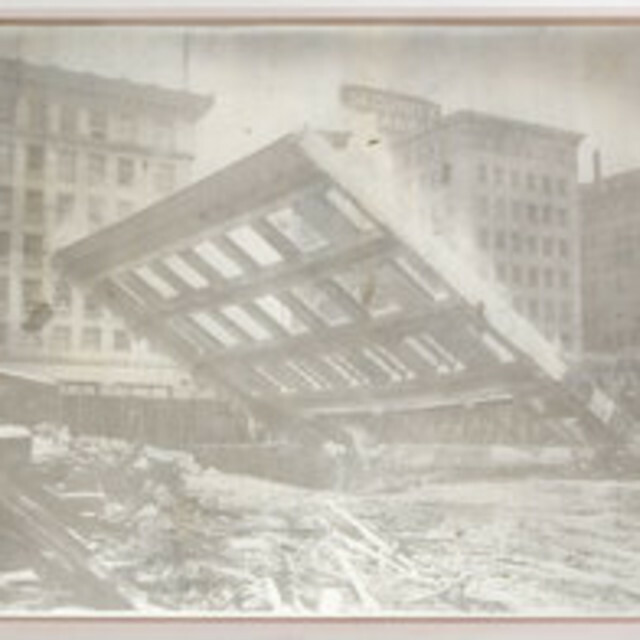 At M + B's booth are large, pale prints of buildings undergoing demolition made by the West Coast conceptualist Matthew Brandt, who copied the images from mid-20th-century photographs found in the Los Angeles Public Library. The key is that the pigment used to create the prints is of dust collected from buildings now standing where the demolished ones once were. 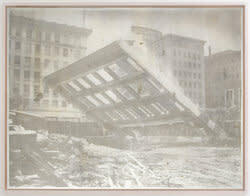 In general, real-world history doesn't often puncture the show's envelope of self-reflexive aesthetics and fantasy, which is why Daniel Blau's display of anonymous newswire photographs of the unfortunate zeppelin the Hindenburg, as it crashed and burned in Lakehurst, N.J., in 1937, is exceptionally refreshing.